Welcome to Mount Vernon. 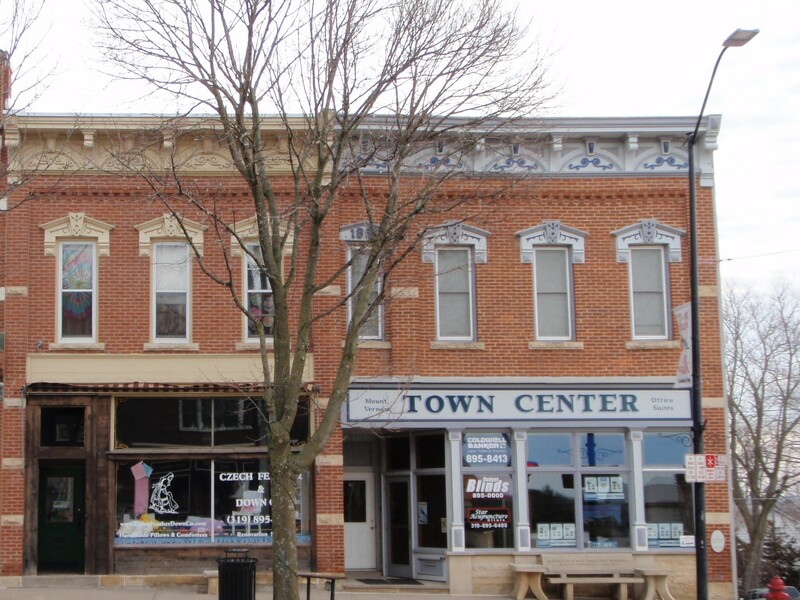 This is a short walking tour of the National Register of Historic Places Commercial District. It places the built environment in the historical context of the growth of the area. To begin this tour, you need to be standing on the corner of First Avenue (Highway 1) and First Street (the main street of town). You need to be standing in front of the building located at 100 First Street W, next to the signal light. If you look to your right (south), you’ll see how the hill sharply drops. It is interesting to note that the hill has been shaved three times to reduce the grade. It is difficult to imagine the tremendous amount of energy that was required from a team of horses or oxen to pull heavy wagons up to the top of this hill when it was dry let alone in wet conditions. Mount Vernon owes its existence to Iowa’s first state road and to its topography. A furrow dug with a plow and oxen from Iowa City to Dubuque today marked as Iowa Highway 1. Lyman Dillon was awarded a contract from a Congressional appropriation of 1840 to create the trail of 100 miles. The trail had been laid-out by Army Engineers. 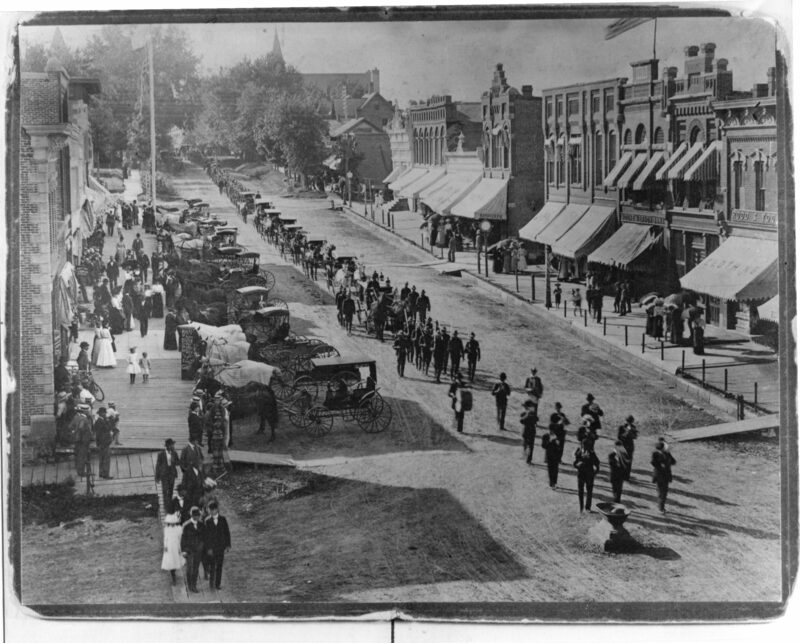 They called it Military Road because it was to mark the way for troops to come from Dubuque to protect the territorial capital in Iowa City, as there were a number of Indian nations to the west of Iowa City. Where the Military Road crossed the crest of the moderate hill or “paha,” businesses quickly developed. When travelers reached the top, they would certainly want to stop, water horses or oxen, and take a break before going down the hill towards Anamosa or Iowa City. Highway 1, the first marked highway in the state of Iowa, was as so the first major north-south link in the state. Because of this, almost all of the traffic going toward the state capital had to go both up and down this hill regardless of the direction of travel. Remember, Dubuque was the largest town in the territory and the early population was on this eastern edge. The Black Hawk War of 1832 resulted in the land in this area being taken from the Sac and Fox tribes, and Mount Vernon’s first residents began settling here soon after. The farmers took the flat lands or lower lands. Within months of each other, William Abbe began farming the land to the east of town in 1836 and Daniel S. Hahn farmed the land to the west. Because no farmers wanted to plant and plow on the large hill this uptown area along the crest of the hill was not only an economic choice, but also an opportunistic option for merchants. We are standing on the corner that separated the dry goods and general business from the equipment and maintenance areas for wagons and later, cars. The mechanical services have traditionally been located to the east and the dry goods and general merchants to the west of this corner. This intersection at the top of the hill has, and continues to be, the historic heart of the town. Through the years we have photographic evidence that there was a watering trough right in the middle of this intersection, which again testified to the fact that the horses, mules, and oxen would water at the top of the hill before going on. Another interesting point to note is that the topography of the hill clearly demonstrates the historical development. Mount Vernon developed primarily along the hill with the south side, with its more gentle slope developing first. The grade of the hill falls more sharply to the north than the south, which may account for the slower development on the north side. Just two blocks east of this corner is a steep stream bed that must be crossed to reach the cemetery, which acted as a barrier to Mount Vernon’s development to the east. The downtown area, the one block that we will be walking along, was originally filled with small wooden structures dotted with some of locally made brick. What we see today is the rebuilding after a series of disastrous fires in the 1890s and generally constructed local brick between 1888 and 1904. The economy was rather good and the fires of 1893-94 created the opportunity for new brick (fireproof) buildings. 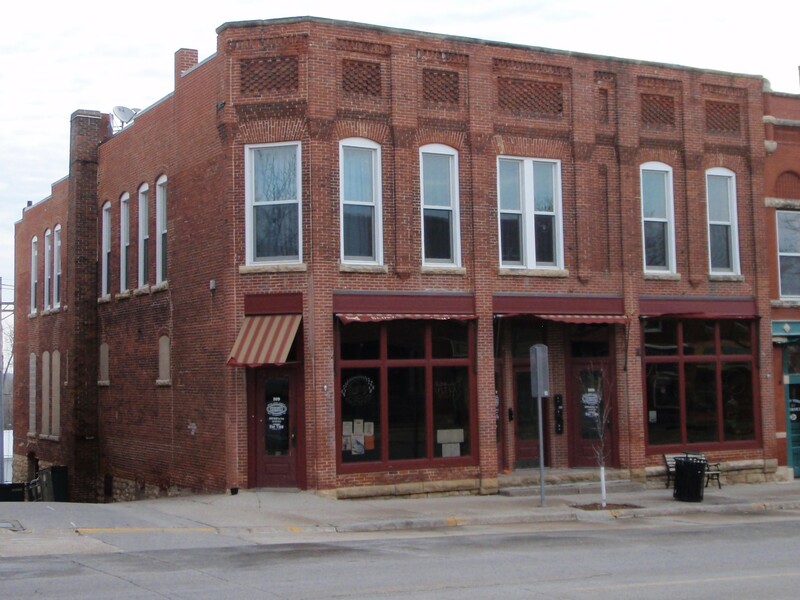 The oldest building in the commercial area is the painted brick building across the street from where you are standing (Southeast corner of First and First). It was originally a three story building constructed in 1856. In 1957, there was a disastrous fire in which the third floor was removed. Throughout its history, it has been a hotel, a community-meeting place, and the home of some fraternal organizations, and retail space. We know it was remodeled in 1891. When Iowa Electric opened the Inter Urban Street Railroad (which ran up and down the middle of First Street) around 1914, it bought the building as its office for both tickets and electrical needs. The building is constructed of locally made brick. This can be observed because it is made from local clay with rounder edges. Note the large round disks on the west wall. These “tie rods” are at the end of iron rods that help strengthen the building by holding the exterior walls to the interior structure, which prevents the weight from causing the walls to bow. Tie rods were usually found between the floors. Notice the small gray house (east side of the street) to the south, about a half a block down the hill. It is one of the early brick homes in a rectangular shape with virtually no ornamentation on it at all. It is also one of the earliest brick homes in the community, ideally located here on the original highway. Behind the current insulating covering is a home of locally made brick in the Greek Revival style, which dominates the town until well after the Civil War. There is another early home on the east side of the highway just a block to the north. Notice the heavy limestone foundations on all these major buildings facing Highway 1. The stone came from the local quarry, and that same quarry provided all the stone for the building of Cornell College’s King Chapel in 1876. Looking across the street, kitty-corner from the Olliver Day Building, we see Lee’s Town and Country Real Estate. The same metal facade covering as is still on the east side of the structure covered the front of the building. The metal front was recently removed – revealing the original brick facade. It is probably the second building on the site known as the Waln corner. Waln was one of the earliest settlers and founding fathers of the town and Cornell College. The building was constructed of soft, local brick in 1881. As you look at this corner building, you’ll notice a great deal of pressed-tin that reaches across the two buildings which really indicates that it was built as one. The pressed tin on the left has been painted to accentuate its Victorian detailing. There are pressed tin with limestone sills on the windows. Notice a line of bricks used as dentals or small little teeth-like brackets are across the front. We are looking at another merchant block here. 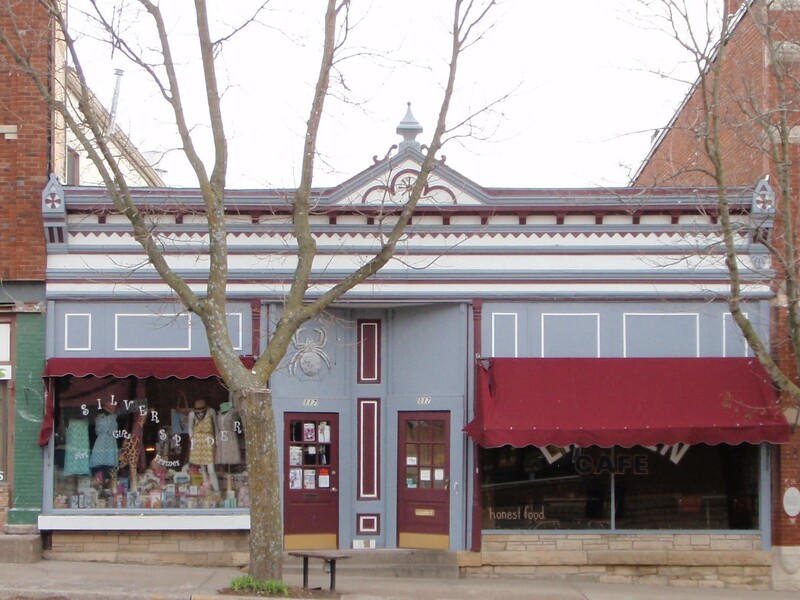 A merchant block consists of two or more stores under one roof and decorated on the upper floors as one structure. As a whole structure, it is a very imposing and lovely building. You’ll see more of these “merchant blocks” just up the street. This is a wonderful example of 19th Century merchandising and building. The windows above are trimmed and the cornice at the very top of the building is trimmed in pressed tin. They may look like limestone, but if you notice carefully where they begin to weather and where the paint peels, you can tell they are really tin. The pressed tin was a commonly used material because it was light and could be tacked to the framework around the windows. It also could dramatically update and change the building from a very plain brick building, such as the ones across the street, into a very lovely modern building for the 1890s and turn of the century. We will see more pressed tin as we go along. This building demonstrates the wonderful 19th Century concept of merchandising. At the time, people did not rely on newspapers, radio or television. Instead, they relied on window-shopping. Note the door is recessed considerably from the outside of the building providing some protection on a rainy day. This was a great merchandising technique because as you window shop you are gradually well inside the space of the store before you get to the door. Before we move on look again at the east wall of this building. Notice another pattern of tie rod ends. Here we have a star. The top of the building is much more finished. Look just below the roof line at the top and you’ll see the little brick dentils that give the building a sense of completion. Such decoration is not on the top of the building across the street because the third floor was removed. You’ll also notice a large area filled in with new brick and glass block that was once a bay window overlooking the street. The window would have provided light into what might have been a hotel sitting room or apartment. It also could have served as a wonderful place to watch the traffic on the Military Road. Now look at the building across the street, 101-103 First Street East. This building was designed and built by a Cedar Rapids architecture firm of Joselyn & Taylor. All of the stylistic features you see in this building are repeated some place or another up and down the street here. This was built in 1894 following the serious 1893 fire that destroyed several buildings in this area. The Drs. Wolfe and Mr. Ellison funded this merchant block. The former wood structure that burned was known as the Smith-Hogel Block. Following the great fire, Smith and Hogel went up the street westward and built a similar brick building at 109. Notice how the brick is laid so it creates arches that accentuate the top of the building and decorate the large brick wall. Also, we see some of the capstones that were originally on these buildings, even though most have been removed. Note the large plate glass windows. If you look at the doorway in the middle of the structure, you’ll notice steel foot plates. WHAT ARE THESE? You can see the pressed tin work above the window line with the decorative pieces painted on the right. At the end of those pressed tin pieces you see they are hiding a steel beam. Keep your eyes open for tie rod ends as we go through this tour as you’ll note at least four or five different patterns in the downtown area. At this point you should be standing again in front of 100 First Street West. 102 First Street W @ 2018. The little building to the west is 102 First Street West. We know Gillette’s name appears on the abstract by 1869. Behind this facade may well be part of the Gillette Hotel from 1869. What you see today resembles a much earlier building documented in some photographs. 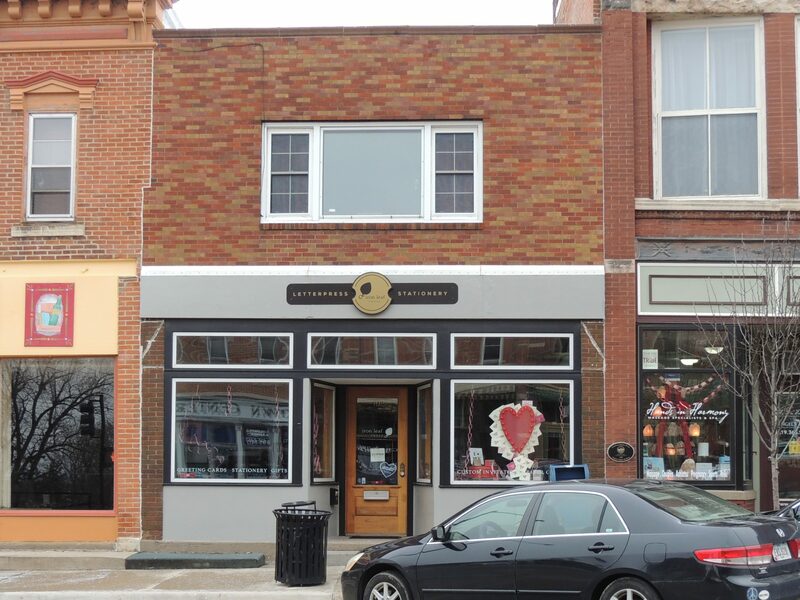 The current owner accepted the recommendations of the Preservation Commission and created this facade that fits 19th century storefronts in Iowa. It has greatly improved this south side of the district. 104 First Street W. @ 2018. The next building is a red brick structure made not of soft local brick, but modern hard brick indicating it could have come by train. The railroad came through the town in about 1858, and by the 1880s, a bridge over the Mississippi River in Clinton, linked Mount Vernon with the rest of the country, specifically New York and San Francisco. This hard brick can be molded and baked in shapes other than rectangles. Brick of this molded type is often called terra cotta brick. The brick is set in very narrow mortar and you will notice that the mortar is also colored, which is another phenomena of the 1890s. Frank Lloyd Wright, notably in his Robie House in Chicago, used the thin colored mortar extensively. The “shopping windows” are large and inviting with a recessed door. Above the panels is a pressed tin piece that covers a steel beam. The garlands with the design pieces on each end have been painted in a copper color to accentuate this very important part of the building. Looking just above the copper banded pressed metal piece, you can see the use of molded brick in the shape of eggs all across the building, underneath the limestone. When the egg is used with an extra piece of molding, it is called egg and dart and is found extensively as a decoration inside and out. The limestone pieces used above and below the windows are called lentils. A local Civil War hero and attorney named Captain Charles Kepler built this structure in 1892. He rented the first floor to merchants, the first being H. D. Butterfield Dry Goods and had his law office was on the second floor. These full glass windows let in considerable natural light and heat on the second floor. The large glass area was needed to provide light for reading law books in this pre-electric era. Above the limestone we see more red terra cotta-style floral patterns and on the freize there is a more delicate designed terra cotta. There are about 4 or 5 different brick designs on this facade, and when combined with the massive limestone, they give this building a unique character. Notice under the large first floor windows there is a cement sill. On the corners, the brick is laid to accommodate this interesting angle of the entry. Now while you are looking down, look at the wonderful cast iron grate piece (or door plate) in front of the doorway to 104. These were very popular among merchants as they served as mud scrapers. When walking across the mud scrapers some of the mud and manure from the barnyard fell off the boots of customers and kept the store cleaner. Some of the first store floors also had oiled floors that made cleaning up easier. The entrance into the second floor of this building is through the door marked 104. The hallway originally had a much bigger window in order to permit sunlight to brighten the dark hall in the era before electricity. You will notice that at the west edge of the building the bricks are rounded. This is a very unusual pattern for this town. Not only is there the pink mortar, but also the rounded corner bricks. Molded clay baked under high temperatures could be made into many different shapes. The original store that was here was called the Humbolt Block and built around 1860. This store burned in December 1996. The facade of this building was reconstructed from photographic evidence. At the time of the fire, the facade was covered with metal siding which obscured the simple brick work. In the reconstruction, about 8 feet was added to the height to stabilize the two walls on the buildings on either side. By continuing the brick pattern of the lower original section on to the increased footage, a rather nice integration was achieved and the historical character remained. The front windows were larger in the original building and where you see wooden panels under the front windows you would have seen more glass to let light into the basement. We move on to the west to 110. We know that the first Mount Vernon newspaper published by S. N. Bauman was printed in this building for many years. 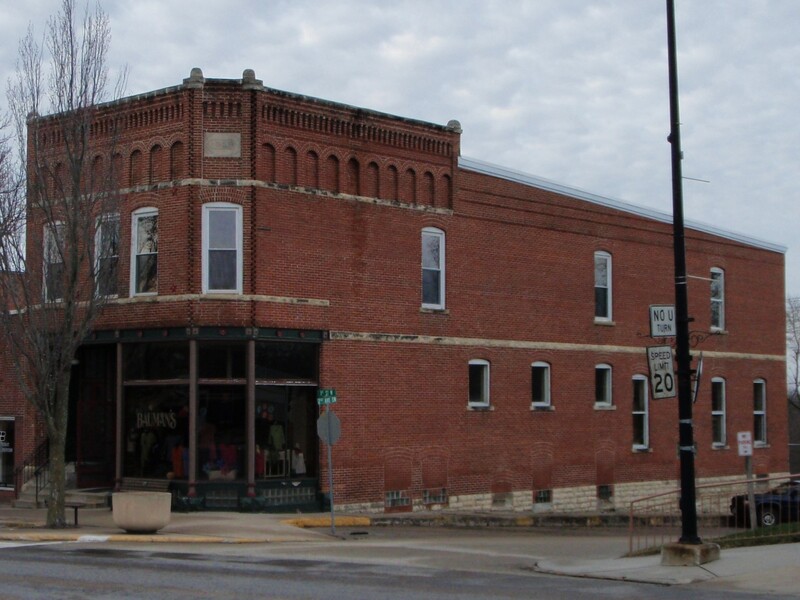 The building comes from 1904, about the same time as the Bauman Clothing Store coming up on the corner. However, while a distinctive red brick is used on the Kepler and Bauman buildings, here there is an unusual (for Mount Vernon) brown or sand colored brick. Noting this, the influence of the railroad and a new awareness of materials and styles become very obvious. Notice again the thin mortar used on the edges & above and the steal beam above the large plate glass windows. Here, instead of being covered by a copper or pressed metal piece, the beam is exposed. Floral medallions are then bolted onto the beam. If you look on up you’ll notice round arched or Romanesque windows. This type of window is used often in this district. In the center of the building is a brick column that ends just below the windows. By recessing three bricks at the bottom of the “column” back we have a decorative arrangement. At the top, the overhanging brick forms an extension that gives this building a very distinctive elaboration. Notice the bricks set on edge just below the corners or dentals all across the top. While brick may seem monotonous at times, by raising brick forward or backwards over a straight wall you can create a sense of decoration, texture and depth. Here we have a great deal of imagination used in a brick pattern. We cross the alley to 118 First Street W. Look at the east wall down the alley. Notice the tie-rod ends on this building – yet another pattern. We are looking at what is historically known as the Clark & Hayzlett Building. It was built in 1869 and has been modified many times. At one time, this area of the street was called a Mammoth Block and whatever was here burned in 1867. Hayzlett and Clark built here in 1869 but the brick facade was added later after a fire, perhaps as late as the early 1900s. It was in the style of the merchant block with an entry in the middle of the building and a recessed doorway. The facade was remodeled again in 2017. The second floor of this building served as a community auditorium and home of the Masonic Order but is now apartments. This was really a very gorgeous building and used to have a large beautiful overhang with brackets and a large cornice which have been removed (see Centennial Book between pages 104 & 105 – Wilcox Hall). One of the important details left concerns the vertical row of coins at the corner of the front and side facades. This is a very large structure and the loss of some of its historic details is really a tragedy. 120 First Street W was built in 1871 as a storeroom for Isaac Wilcox. T. S. Brokaw, who served as Postmaster, occupied the building for some years. The next building has a cornerstone from 1904. This is the Bauman’s Clothing Store built by the International Order of Odd Fellows. If you stand in front of the door and look to your left, you’ll see the door that leads to a large stairway. This stairway goes up to the lodge meeting room on the second floor. Again, we have the exposed steel beam that is supporting the upper stories in the area below with the large glass windows. Its functionality is disguised by decorated medallions in floral pattern. At one point between each of these floral medallions was a letter to spell out Bauman’s in gold leaf. This building is truly a treasure because it is practically untouched from 1904. It bears the name of the Odd Fellows Organization on the corner near the top. The first floor occupants of this building, Rood and Young, went into bankruptcy in 1909. The present clothing store, Bauman’s, took over in 1910. This is the oldest continuous merchant business in the community. The posts holding up the beam are cast iron. These are the original shape and dimensions of the windows. Notice the enormous transom window over the door. This is all original. If you can take the time, I suggest that you go inside where you can see the clothes racks that pull out from the wall, all the cases of a bygone era on display, and in the back, the high balcony where the manager could sit and watch the front door or observe his employees at work. The building also has a full basement that has housed barbers, tailors and craftsmen through the years. Now, it is a place to come and have coffee every workday with retired persons in the town, as well as the young merchants. As you walk past the building and look south down the Second Avenue, you’ll notice that the Bauman Building also has a wonderful limestone foundation. You will also see the outlines of large windows that were once there to let light into the rather dark basement. Towards the back of the wall are glass blocks and brick where a door to the lower level once stood. Now as we go back onto Main Street and look across the street, looking north, we see a large building that shows how structures are modified and changed over time (125-123). This building is almost completely reconstructed. The building on the corner was a lovely building with a high parapet with lovely pressed tin designs and finials across the top. About the only piece that remains from that original structure is the overhanging bay window. It bares very little resemblance to the original. Perhaps the elevated entrance and bay window are all of the front facade that remain. The Centennial Book has a good picture of both the original Bauman home set back a good distance from the street. You will also see a large store addition to the front with its vertical lines (see pictures p. 210, between pp. 96 & 97, and between 105 & 106). Look at the west wall and see if you can trace the additions and modifications. 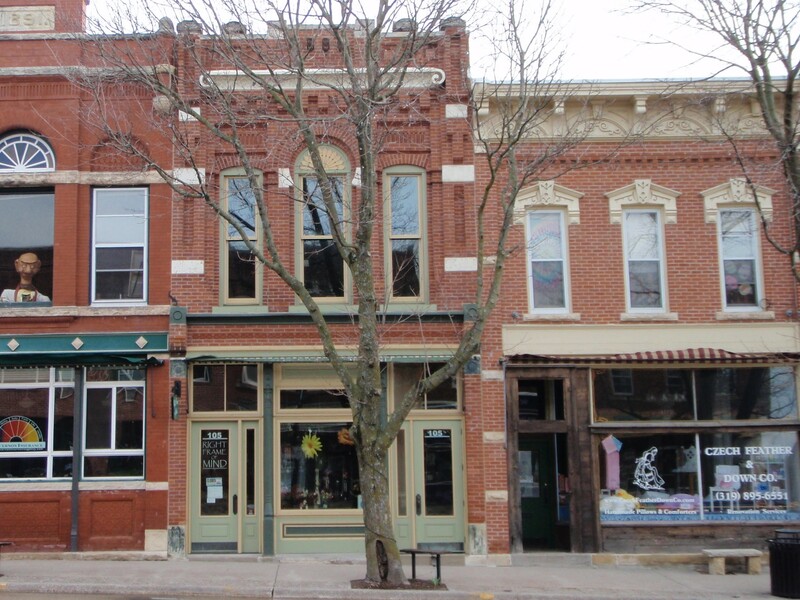 The next building to the east shows the effort by a property owner to create a 19th century storefront. It was designed by a local architect, Ed Sauter. 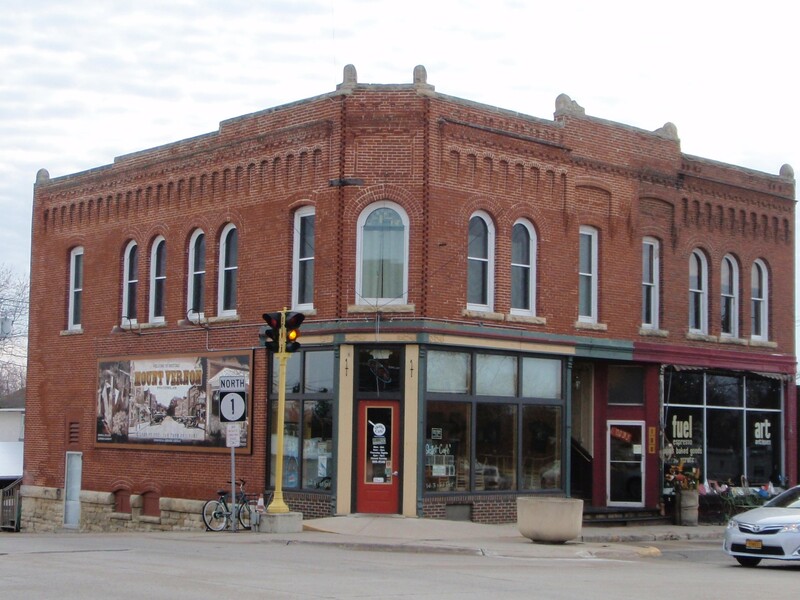 He recreated this after a great deal of research on Iowa small town merchant buildings. Features and designs were selected to reflect the look and historic character of the small town and appropriate to the Mount Vernon streetscape. The building is joined to the building at the right. If the facade from the upper part was removed, the original style of the building could be observed. 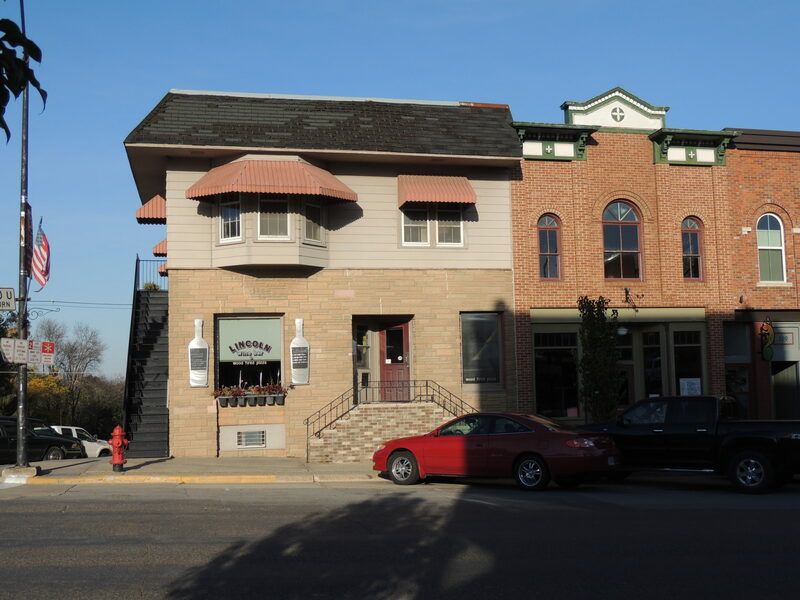 This was a merchant block–two stores with a second floor entry up the middle. The East portion of the building is original and may reflect the original structure from 1894. However, the brick on the west portion was so badly deteriorated that this new facade was necessary. We are not sure about the condition of the brick behind the current covering of the east side. Now as we move east we come to the only one-story building in the north side of the district. It is again a merchant block–two joined stores. The Wolfe Brothers, consisting of a doctor and dentist, built this building, as well as two more on Main Street. It dates from 1894 and first housed a barber shop and restaurant. As far as we can tell, the building is literally untouched. If you look at the upper parts, you will notice that most of it is pressed tin. 113 is one of our best examples of 19th Century commercial architecture. 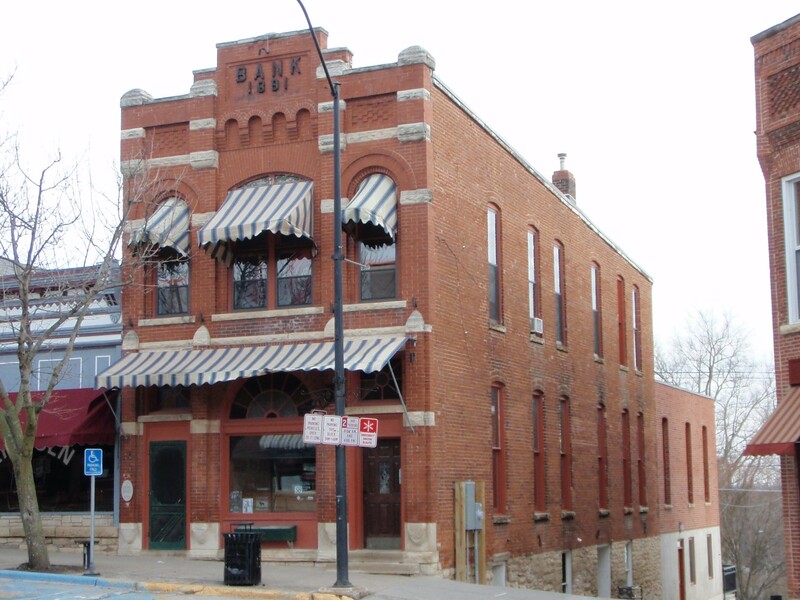 At the top we see “Bank 1891.” It was built in 1891 and was originally the Collins Bank. Collins died in 1892 and Brackett, who was a prominent builder of many homes in town, bought the building. Quickly, it became the Charles Brackett Store. You are essentially seeing the original building. Fortunately, in the basement of this building, we found large colored glass transom windows that had been above each of the doors on the first floor and the original arch-colored glass that was discovered still in the frame but covered by a wood panel. You will notice a very smooth brick, a large arch over the front window, and the narrow mortar. This building is banded with limestone and along the top are lovely little arches that decorate the top. This building had a stair step series of limestone blocks up to a single capstone on the top. Most of the buildings in this historic district had the same style of caps that give a sense of verticality. Today the streetscape is much more horizontal because these caps are gone. Most were removed because they were not maintained and there was fear they would fall. Looking in to the alley, there are a few historically noteworthy items. You will notice long narrow windows on the building that are mostly all in their original shape, preserving historical integrity. Notice just above the limestone footings, tie rod ends in the shape of an S–this is another practical, yet decorative design. Now we are in the front of 109, which was once the Smith-Hogle Building of 1894. 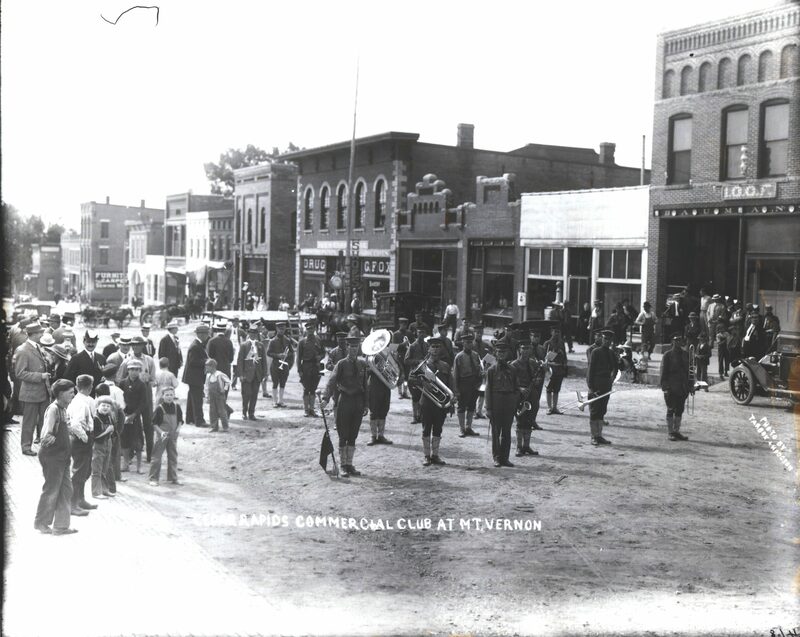 It was part of a rebuilding after the disastrous fires in the downtown area in 1893-94. It also is a merchant block and you will notice the entrance in the middle again where you are under a roof and can window shop. This is all now one store. It also has a door in one corner at a 45 degree angle so that you can enter the building not only from the front directly, but from the angled corner. This building bears a great deal of similarity to the other buildings along the street in the way it uses brick and the use of the brick column. Notice that the stores on this north side of the street have awnings because of the late summer sun. The awnings up and down the street protect merchandise from fading, as well as providing shade. They also add a great deal of color and charm to the community. 107 is a remarkable reflection of the spirit of 1891 when it was built. It was built for the Mt.Vernon Bank, largely owned by William Smith and Dr. Charles Carson who first occupied it. I regard it as one of our finest landmarks. Underneath the large window on the second floor are rounded bricks. If you go across the street and look at this you will see the use of large amounts of limestone, varieties of the arch shape, and tubular shaped terra cotta bricks. The top of this building would have had three or more limestone blocks leading to a cap. 105 was built as a Post Office for T. S. Brokaw in 1888 by Rood and Young, also merchants on Main Street. There is an enormous amount of brick detailing as well as terra cotta and a pressed tin piece that looks like a scroll at one end. You will notice other places that look like stone, but may be brick. Just above the metal flashing are wood cornices that duplicate pressed-tin pieces. We are back to the most historic spot in Mount Vernon–the junction of the first highway in the state of Iowa and main street Mount Vernon. When the original town was plotted this was almost exactly in the middle. The original town was about a block and a half to the east and west and a block north and south from this very spot. It was plotted in 1847. The top of the hill became a small trading center for all the farmers in the immediate area and it is still a street of small local merchants who continue to keep the town viable. Anchored by excellent transportation and a strong private liberal arts college, Mount Vernon is a town with a proud heritage and we are glad we were able to share it with you. Thank you for joining us.